$155 inscriptions 3 words or less, NO HOF 16 inscriptions. 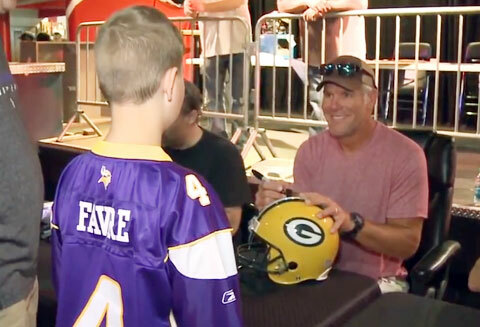 Mr. Favre will not sign Artwork, game used, or Hall of Fame items. Brett Favre was a two-time Super Bowl champ and three-time NFL MVP during his career with the Green Bay Packers from 1992-2007. Favre, who spent the most of his career with the Green Bay Packers, was a 20-year veteran of the NFL, having played quarterback for the Atlanta Falcons (1991), Green Bay Packers (1992–2007), New York Jets (2008) and Minnesota Vikings (2009–2010). He is the only quarterback in NFL history to throw for over 70,000 yards, over 500 touchdowns, over 300 interceptions, over 6,000 completions, and over 10,000 pass attempts. On Jan. 17, 2011, Favre officially filed his retirement papers. Playing Field Promotions is a booking agent for motivational sports speakers and celebrities. If you would like to book football speakers or NFL stars like Brett Favre for a speaking engagement, personal appearance or special event, you can request Brett Favre agent and speaker information from PFP Sports & Celebrity Talent or call 800.966.1380.